A girl named Trisha previously owned this book. But it somehow made its way to a magazine stand in our area. One of my kids who frequent the place saw the little book upon piles of magazines and bought it. 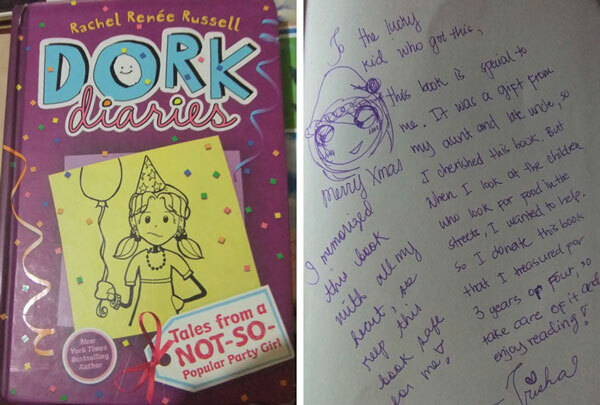 When my son checked the inside page, he saw a hand-written message signed by a girl named Trisha. This book is special to me. It was a gift from my aunt and late uncle, so I cherished this book. But when I look at the children who look for food in the streets, I wanted to help. So I donate this book that I treasured for 3 years or four, so take care of it and enjoy reading! *I memorized this book with all my heart, so keep this book safe for me! Her love for books is truly remarkable. This entry was posted in Inspirational, Kids and tagged dork, magazine stand, second hand book, trisha on March 6, 2013 by Yami.